You only have a little over 2 days left to book IHG Rewards Club's Your World Sale! It provides up to 30% off stays around the globe for IHG Rewards Club members, discounted Points+Cash offers and more. If you are not a member yet it's free to join. Book the IHG Rewards Club Your World Sale here! The “Your World Sale” promotional rate is valid only for bookings made from November 11 2017 through November 29 2017 and consumed through March 31 2018 at participating IHG hotels in the United States, Canada, Caribbean, Central America and South America. You must be a member of IHG Rewards Club to qualify for the discount, which ranges from 15%-30% off the Best Flexible Rate. This is a qualifying rate and the discount varies by hotel, blackout dates apply, rooms subject to availability. This rate is fully pre-paid and non-refundable. Hotel policy varies in regards to the number of guests allowed per room. Not applicable with other discounted rate promotions. Not applicable to group bookings. Hotel-specific early departure fee applies. 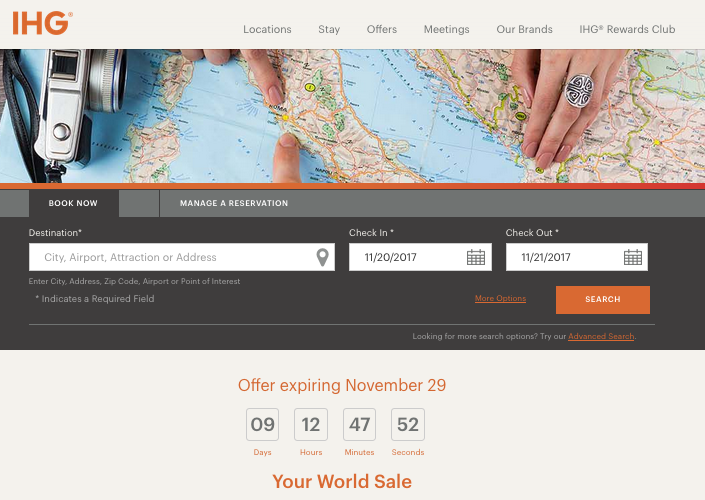 The “Your World Sale” promotional rate is valid only for bookings made from November 11 2017 through November 29 2017 and consumed through March 31 2018 at participating IHG hotels in Europe. You must be a member of IHG Rewards Club to qualify for the discount, which ranges from 15%-30% off the Best Flexible Rate. This is a qualifying rate and discount varies by hotel, blackout dates apply, rooms subject to availability. This rate is fully pre-paid and non-refundable. Hotel policy varies in regards to the number of guests allowed per room. Not applicable with other discounted rate promotions. Not applicable to group bookings. Hotel-specific early departure fee applies. The “Your World Sale” promotional rate is valid only for bookings made from 11 November 2017 through 29 November 2017 and consumed through 31 March 2018 at participating IHG hotels in Greater China. You must be a member of IHG Rewards Club to qualify for the discount, which ranges from 15%-20% off the Best Flexible Rate between November 11 2017 and November 17 2017. A discount of up to 14.5% will apply November 17 2017 through November 29 2017 based on normal Your Rate APR. This is a qualifying rate and discount varies by hotel, blackout dates apply, rooms subject to availability. This rate is fully pre-paid and non-refundable. Hotel policy varies in regards to the number of guests allowed per room. Not applicable with other discounted rate promotions. Not applicable to group bookings. Hotel-specific early departure fee applies. The “Your World Sale” promotional rate is valid only for bookings made from November 11 2017 through November 29 2017 and consumed November 18 2017 through April 15 2018 at participating IHG hotels and resorts in Asia Pacific, the Middle East and Africa. You must be a member of IHG Rewards Club to qualify for the discount, which ranges from 11%-30% off the Best Flexible Rate. This is a qualifying rate and discount varies by hotel, blackout dates apply, rooms subject to availability. This rate is fully pre-paid and non-refundable. Hotel policy varies in regards to the number of guests allowed per room. Not applicable with other discounted rate promotions. Not applicable to group bookings. Hotel-specific early departure fee applies. 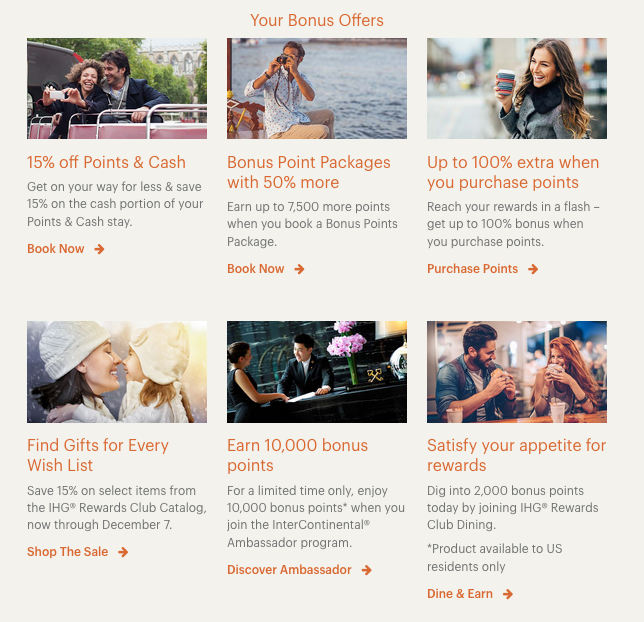 A one-time bonus of 10,000 Bonus Points will be awarded to you approximately 6-8 weeks after you successfully join the InterContinental Ambassador program. Offer is valid from November 11 through November 29.